After having my son in 2014, my healthy eating and fitness waned. As someone who has struggled with their weight there’s always things I wish I’d gone back and done differently. I doubt I am the only mum who feels this way; pregnancy can certainly do strange things to the body. It’s easy to fall into bad habits when you’re pregnant and very hard to break them afterward, trust me I am speaking for experience. Looking after your health and fitness post pregnancy can be difficult; having the energy to exercise just isn’t always possible. So many women today turn to surgical options to help them get back into shape but before you consider that why not try the traditional way? An abdominoplasty, or tummy tuck, costs can vary but many women will gladly pay the money to feel like themselves again. So how do you stay fit and healthy post pregnancy without resorting to surgery? Well, it’s not all about exercise thankfully; your diet is just as important. I’ve done my research and outlined what I think are some of the best post-pregnancy health and fitness tips. So if you’re a new mum why not give some of these tips a try? Pregnancy really takes its toll on your body so whatever you do don’t rush to get back into shape. No matter how you feel you can’t go running or to the gym a few weeks after you’ve given birth. Take at least six weeks to recover fully and get your strength back and start small and in time work yourself back into a routine. 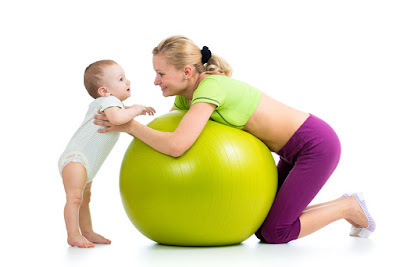 Exercise classes and sports are not really an option post pregnancy at least straight away but don’t worry there’s plenty of ways to lose weight without such strenuous activity. One of the best ways to stay fit and healthy post pregnancy is to take regular walks. The best thing about this is you can do it with your baby; just a short walk down to a friend’s house or the corner shop can really help with your fitness. One of the best fitness tips for new mums is to find something you enjoy doing and do it with a friend. If you join a new mums group you can make improving your fitness a goal that you can share together. Whether it’s just walking together with your babies or taking a light yoga class you’ll have more success staying healthy if you work with someone. A diet is a great way to lose your baby weight and get back into shape but don’t do it straight away. A common mistake many new mums make is that they go on a diet too soon, give yourself at least six weeks before dieting again but if you feel like you need longer then don’t be afraid to wait. If you diet too soon you’ll just make your recovery harder, so feel free to plan a diet but don’t start it till you’re ready. Swimming is a popular way to take care of your health and fitness post-pregnancy, many mums also find swimming relaxing and you can even take your baby with you when they’re old enough. Remember to wait until you’re ready and able before you take to the swimming pool and take it slow. Don’t set unrealistic body goals for yourself post-pregnancy, looking after your health and fitness is important but you need to be realistic about it. You’re not going to get back into that swimsuit straight away, being realistic about your body goals will help keep you positive and happy.